Cats of Wildcat Woods: Goat TV is Back! With all the cold snowy and icy weather our neighbors the goats have not been out of their barn at all. Too cold and the snow froze into inches deep ice blocks so they could get hurt coming out. We missed them. This week the weather warmed up enough to let them out. We were so excited and ran from window to window telling Mom! We love to watch them play across the street in the pasture. Hey Mom...the goats are back! We also had another visitor - an opossum. Mom came out to feed us the other night and the little guy was sitting next to the door feeding on seeds from the bird feeder. He looked as startled as Mom. She didn't have her camera or we would have picts of him. We may have to keep him away as she also found a small hole in the corner of the gravel floor in the screen room. Norm was over there messing with it and Mom checked it out. One of us could have gotten out but none of us did. Mom filled the hole in with rocks inside and out. Maybe the possum was trying to come in where it was warm and there was food. One more wildlife adventure this week.... Pop heard a loud drumming noise and saw pieces of wood chips raining down from the old maple tree in front. 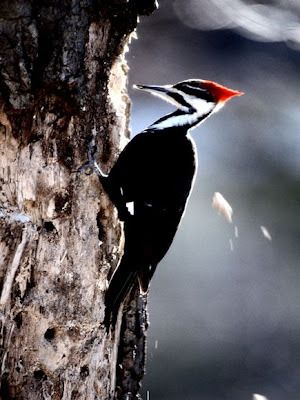 He looked up and there was the Woody Woodpecker of woodpeckers - the pileated! They are big and so funny looking with a red crest on their head. He was busy looking for food in the dead branches of the tree. He kept us occupied (and the beans too) for quite a while. They were almost extinct but are making a comeback in some areas. Ivy watched from the bathroom window for a long while drooling over this BIGGGGG bird she couldn't have! And that's our wildlife show for today! Happy Caturday! For more animal posts from all over check out Camera Critters. And be sure to visit Pet Pride too. Enjoyed your CC post today. Opossums have actually made it north to our part of central Ontario; unfortunately the only time I see them is when they're roadkill. The cats are lucky to have you looking after them. These are such great pictures. Possums love cat food. We use to have a lot of them in our back yard. They are cute when they are babies. My favorite picture is the cats watching the goats. Such pretty white cats! Oh I love your story here cheri..don't ever be close to possum they might eat you to pieces ^_^ Happy weekend. How cool that your kitties have ongoing reality TV shows right outside their windows! And there's certainly a lot to see and hear, isn't there! Oh, I'm so glad none of the kitties escaped through that hole, and everyone is safe and warm inside. And white cats beautiful !!! here is the snow also almost gone !! Snow white kitties in snowy country, watching goats in snow... what a cute! I always want to live a place like there in pictures... lucky you!! Cute post today. Love the title! So appropriate. Oh! We are all hoping to get a cat run so we can go outside! You all look like you're enjoying Goat Tv! We have lots of woodpeckers here, but Mom says she has only seen possums that have been hit by cars. Excellent story! I love the title "goat tv"
Wonderful critters in around your yard! Great photos. That's a heck of a lot of wildlife indeed! Wow! You guys have so much stuff to watch!! How cool is that? You've had a busy week, what with goat TV (much better than real TV, no doubt) and an opossum and that beautiful woodpecker. Goats and an Opossum? How cool! What a great entry you have. Hope you have a nice weekend. God Bless! We're MOL @ Goat TV! That woodpecker is gorgeous! Beautiful lucky cats- so much entertainment for them. Thanks for visiting the Shelter! That's quite a show - lots of lovely wildlife! Such sweet goats - and cats, of course! Goat TV! How cool! You have so many wonderful things to watch! That seems to be a great goat tv. All your cats looks really excited! love the picture! 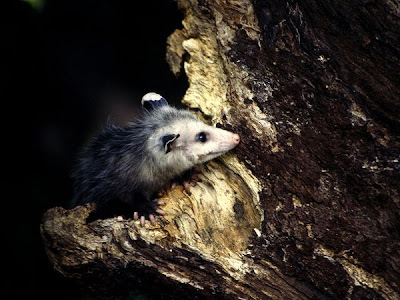 We don´t have here opposums! What a cool group of kitties! Wow, I sure did enjoy the wildlife show...way cool!!! Wandered over from Marg's blogs. I saw that you commented that you shared Lenox and Diamond on your Facebook page -- thank you so much! I originally posted them on the Cute, and have been so grateful for all the help everyone has put in to share their story. They are still looking for a home, so I'm still keep all fingers and paws crossed. I'll make sure to keep everyone updated. In the meantime, let's keep spreading the word to find these babies a forever home soon! Wow - you have a lot of wonderful things on your kitty TV! Wow! You guys sure have a lot of company! And you look like you have a lot of fun! You get to see real live goats?!? You are so lucky! I love goats. Wow, I wish we had that TV station at our house! How cool is that? It was like Mutual of Omaha's Wild Kingdom right outside your door. You are so lucky! Hey Cherl, I donated for your feral cats. I think what you are doing is wonderful. I love,love Cats. Please keep up the good work. I hope you find homes for all these deserving kitties especially the deaf cat.